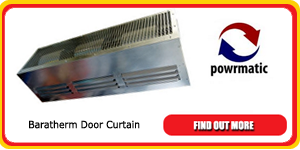 Powrmatic Baratherm units provide a high velocity door air curtain. The standard unit is for applications in that the air stream is not heated and will assist in preventing air movement out from the space and thereby reduce energy costs. The Baratherm unit can easily be ducted onto a heating source such as our NVx or CPx heater ranges.